An organized home office is a productive home office. With the growing trend of remote workers, it’s also a necessity. In fact, a recent study found that remote work is statistically a boon to productivity. Over two-thirds of participating managers found that allowing employees to work remotely increased the number of deadlines met and projects completed. The trick to working from home effectively is the same as working from anywhere else: you gotta stay organized. The more put-together your home-work office is, the more effectively you’ll be able to focus and get work down. 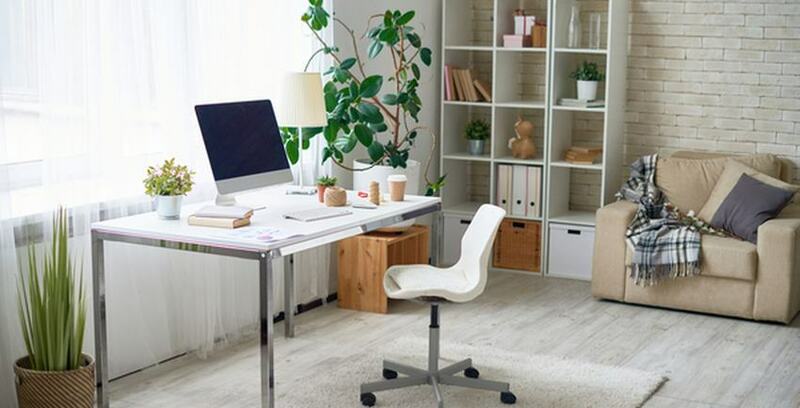 Here are 7 ways you can keep your home office organized, so it’ll work for you. Keep paper to a minimum. Consider going digital by scanning and storing all documents in the cloud or on an external hard drive. It’s much easier to make room for a single scanner than it is to store box after box of papers. It's much easier to focus in a space that isn't cluttered. Just because it's your home office doesn't mean you're always going to remember where everything is. Labeling boxes, drawers, and bins will help a lot. With the help of your labels, you’ll always know where things are when you need them. It'll also help you avoid the inevitable "panic mess" that comes when you're trying to find something you've lost. Cleaning your office so you can be more organized can start with a single idea. You could start by simply completely clearing off your desk. Remove everything except for your computer and phone. Go through everything that was on the desk and ask yourself how often you use it. If you don't use any item more than once a week, put it away to clear space. Admittedly, this isn't going to directly help with organization. It’s more about productivity. Fresh air from a desk plant will help you think and work more clearly. There are all kinds of ways you can make your office more streamlined. For instance, if you use your wall space creatively, you could clear up clutter and maximize efficiency. Try cool DIY projects like this oversized plywood pegboard or one of these clever office calendar hacks. You’d be surprised how much a clear area can help you think. Keep your cables from tangling. Tangled cables are a big mess. Not only can they literally trip you, but they’re just plain ugly too. Either invest in a few ready-to-buy detanglers or try one of these cable-organizing DIYs. Create a special mail station. One way unnecessary mess gets out of hand is when mail piles up everywhere. The more mail you have sitting around, the harder it is to think. Instead, you stare at envelopes, think about all the other work you have to do, and wind up overwhelmed. Avoid that nasty overwhelmed feeling by managing your mail early and often. A special mail station for sorting and organizing could help significantly. There are a lot of cool DIY mail station projects out there. One of our personal favorites is this one made from old books. However you do it, make sure you stay on top of organizing your mail. Home organization can happen in a wide variety of ways. One of the best first steps for anyone looking to clear their space is to get a storage unit. This allows you to tackle rooms--like your home office--one at a time. Without clutter or stress, home organization projects become much easier. If you’re interested in organizing with the help of a storage unit, get in touch with Storage Direct any time. We’ve got everything you need to make your home office work for you.